This is a new national challenge that replaces the NEDIC Love Yourself Challenge. It covers some similar ground having the girls examine how the media shapes their perception of what it means to be a girl and builds their self esteem to counteract some of the more negative images. The challenge starts with a backgrounder for Guiders that gives you word definitions and information on eating disorders, media etc. It also includes core program connections. Then there is a separate challenge document for each branch with age appropriate activities out lined in it. Looking though the Guide challenge I’d expect it to take 3 or 4 meetings to cover the challenge well. But it covers a lot of core program areas along the way. And could make for a really meaningful month of meetings. 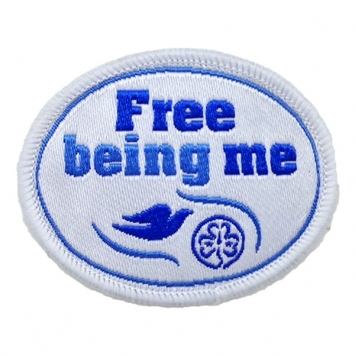 The Free Being Me challenge from WAGGGS aims at “Empowering girls through improving body confidence and self-esteem”. It is similar in scope to the national Love Yourself Challenge. The challenge is structured around a five meeting outline. There are two outlines livable, one for girls from 7-10 and one for girls 11-14. There is also a leaders pack. The packs are beautifully produced with really nice looking hand outs. Most of the activities are only 10-15 minutes long so if you didn’t want to spend 5 whole meetings on this subject you could spread them out over the whole year. 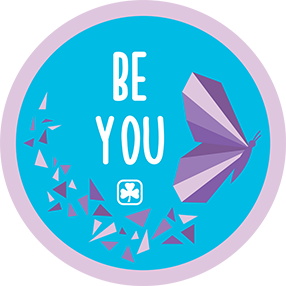 Crests are available from the WAGGGS site in packs of 10. But the liveliest bass on the lake. If you have a song-sing it. If you have a talent- use it. If you have a love – diffuse it. If you have a sadness – bear it. If you have a gladness – give it. I you have a religion – live it. If you have a prayer – pray it. If you have a kind word – say it. We all have songs that we may sing. We all have low and joy to give. These things God’s given us to share.